Jesus said, “It is finished!” Then he bowed his head and gave up his spirit. What you can see in this picture is a view I have had repeated opportunities to view in real life this year. Actually, I don’t think this picture even begins to do the real view justice. To me left I am looking out at the Mediterranean Sea. Before me, are the north end of the Syrian Gates. It is a spur of the Taurus Mountains that comes all the way down to the coast of Southern Turkey, Syria, and Lebanon. The famous port of Syrian Alexandria marks a point where there is a gap in those mountains that provide land access to Syria and the interior. Just a short hop inland from here is Syrian Antioch. That city holds the oldest known church building in the world. It is also the place where Paul began his missionary journeys that turned the world upside down. There is so much history and beauty packed into this small piece of geography. When I am in this area, there is a pathway along which I will walk and pray and write. Sometimes I will simply stop and look around in awe. From that pathway, I can watch the sun rise over the mountains early in the mornings. Later in the evenings, I can turn in the opposite direction and watch the sun set into the Sea. Again, I can snap a photo (up top) but I am completely unable to capture the beauty. Every single day, creation becomes a canvas displaying the majestic artwork of our creator. And this is just one point on earth. I can think of other majestic vistas I have had the joy to experience in Turkey. There are others I have enjoyed as I have climbed multiple mountains and canyons in New York, visited sandy beaches in California, South Carolina, and Florida. Thank You Lord Jesus for saying “It is finished” for thenYou wrote “it is not finished” for the sinful, for Your grace became suffienct for us. A beautiful post to start the morning with. 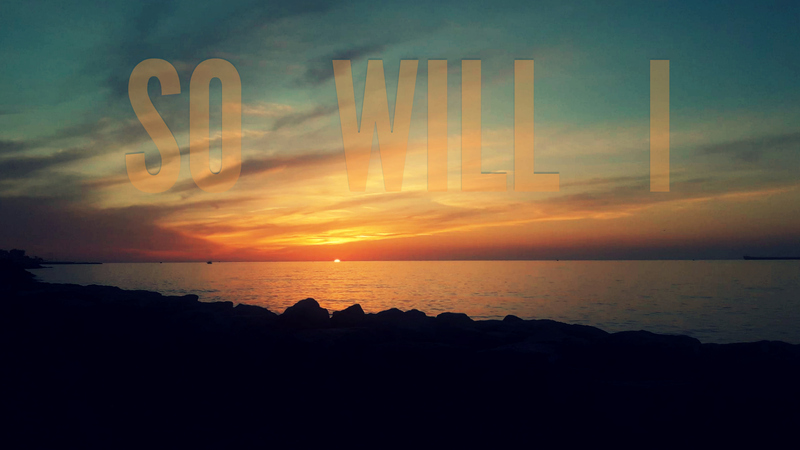 Did you write the final poem “So will I”? I want to share that on my FB page and need to properly credit. I guess I can post link to this as credit. I just know you as BJ is that enough? The theme of true humility being like creation is powerful. I have defined humility as; simply taking one’s role in creation and living in harmony with the Creator like all the rest of creation. I think this can be appealing to many because it is so simple and natural. It is actually lyrics to the song above by Hillsong United. I love how you connect your “present” moment with the presence of God. God truly loves us and is with us always. Both in the beauty of the environment He gifted to us and in His Son whom He sent to redeem us all so that that beauty can be eternal and to its fullest.